I was single, and dating. This is always a tricky time, dealing with human hearts in a lawless grey zone, where no rules exist but those we hold ourselves to. Well, that might be a bit dramatic, but you know what I mean. I found myself in a situation I was increasingly uncomfortable with, seeing two women too regularly for it to be casual – while I wasn’t violating any rules, any promises, any stated expectations – I was nonetheless old enough to take some accountability for my responsibility to do no harm to those I lived alongside. And deep down, I knew that I wasn’t really doing anyone right. So when Becky – one of the two women I was dating – told me that she had done a tarot reading in which I had come up as the reversed King of Cups, I knew it was time to examine the situation and myself. Dishonest, double-dealing man; roguery, exaction, vice, scandal, pillage, considerable loss. Always the skeptic, I found myself doubting that Becky had really even drawn that card for me … maybe she was just obliquely telling me that she knew? It was just too accurate … and I’d never had anything but scorn for tarot card readings and other forms of divination. But it didn’t really matter, because regardless, it made me realize that I should be striving to date ethically, the same way I was increasingly striving to live in other areas of my life – if I was going to eat more humanely, I should also be living more in line with my spiritual inklings in all domains. To be a rogue and justify any damages done as “not my responsibility, I didn’t lie” had worked fine for me in the past, but it wasn’t going to fly with the transformed Self that I was busy creating. Although I had long been the harshest of skeptics about the tarot, now, in the post-teapot swirl of synchronicity, the way I was starting to see reality had room for all kinds of interconnectedness between mind and matter, external and internal realities. I was sometimes even open to the idea that the universe itself was living, aware, and communicative. 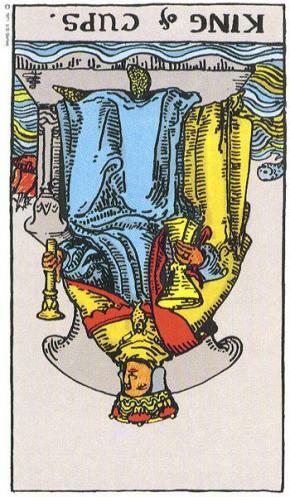 And in such a universe, tarot cards were a meaning-laden context into which synchronicity could very well flourish. So later that evening, when I found myself feeling simultaneously utterly mystical and utterly upset about my dating situation, I decided I would try using tarot cards for the first time. I took out the Waite-Rider deck that had somehow made its home in my sunroom and paced through my house, shuffling the cards and holding Becky in my mind, succeeding at this mental focusing in a way I am rarely able to do, aided by photos she’d taken, items we’d found together, memories of significant events. After a couple minutes of this, I thought “WHAT AM I TO BECKY?” and laid three cards down face down, in a simple three card spread that Becky had taught me. Love, intimacy, deeper feelings … beginning of great possibility in this area of life. It can mark the start of a new relationship. Very accurate, and the waters of life resonated with me as being similar to Lake Superior, which had been very bound up in our early relationship (we went there together the day after we met, and had returned there several times). The blood drained from my face – it was the first time I’d ever done tarot cards, and I’d gotten the exact same card that had thrown me into turmoil in the first place, leading me to dabble in tarot. I’d been feeling mystical, in the flow, sure – but this was a little bit much. 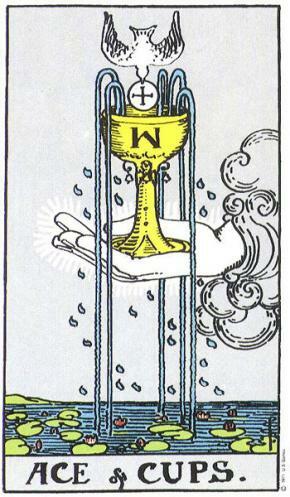 After being stunned by the reversed King of Cups, I was extremely sensitive to this card – and it said to me, very clearly, that I was going to have an evil effect on Becky, if I did not change the Present. In that moment, I had no doubt at all that the cards I got were meaningful, and not random coincidences. 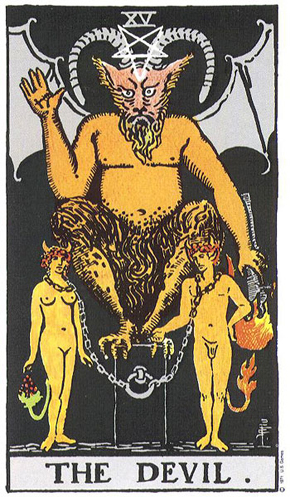 And even when I was slightly less certain, later on, I still knew that the message was true – and that a Devil was the last thing I wanted to be in her life. Months went by, and eventually it became clear that the respectful ending had come in time to salvage my friendship with Becky (and with the other woman, who I’d also ceased dating). Becky and I each went through other relationships – after a couple of years, it became clear that we could try romance again – with an honest and open fresh start. All forms of divination – from the tarot to the I Ching to the shapes that tea leaves form in a teacup. There’s another meaning to that king of cups – he’s the man who follows his heart, and in my opinion, of the four kings, he’s the best. Oops – all forms of divination are based on synchronicity – forgot that part! Tarot cards sometimes work. I got mine read years ago and they said my life was going to turn around in a good way, and literally days after that I was introduced to my girlfriend and it lasted 11 years. I just wish the cards would have told me it was only going to last 11 years, I would have started looking at other options at about the 10 year mark! I may be biased, but I was thinking and I love the way this story illustrates how Tarot does not tell you what the future holds but instead it gives insight into what it could hold if you continue on the path that you are on. If you recognize where your trajectory is sending you, you can change it…for the better in this case. Thanks for heeding the warning babe. Life’s Like A Deck Of Cards. For the past few years now, something rather beautifully peculiar has been popping up (literally) on my path. Almost on a weekly basis, I’m finding ordinary playing cards on my path (on the street). Usually I’ll find one a week, though sometimes two. Why this is strange to me is that I’m also an amateur Tarot reader (as in, I don’t charge), and playing cards have their equivalent in the Tarot Deck. I create it, then the YOUniverse reflects my choices, possibilities and decisions back to me via reality, or to be more precise : synchronistic signs, symbols, and in my case – cards. I mean, the chances of finding single traditional playing cards on the street?! Exactly who’s playing cards out there on the road? Angels playing snap? I’m just thankful for such an interactive YOUniverse.